A three-day gathering in Lower Manhattan highlights worker rights. Opening plenary at the 2013 LAWCHA Conference. 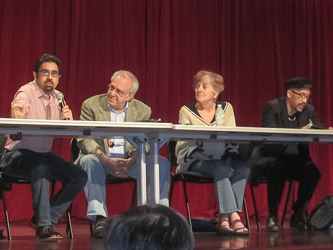 From left: Saket Soni, Richard Wolff, Frances Fox Piven, Bill Fletcher, Jr.
With an aim toward drawing attention to the growing challenges of the worker in today's world, Brooklyn College co-sponsored the Labor and Working-Class History Association Conference (LAWCHA). Held from June 6-8 at various venues in Manhattan, the theme this year was "Rights, Solidarity, and Justice: Working People Organizing and Present." The LAWCHA's panels, roundtables, and workshops, covering topics such as Labor, Human Rights, and the Media; the History of the Working Class in America; and Racism in the Workforce, focused on the challenges faced in seeking justice in the job market. "Working people, whether in full-time work, underemployed, or unemployed make up the majority of populations in the U.S. and elsewhere," said Kimberley Phillips, former dean of the School of Humanities and Social Sciences at Brooklyn College, and a past president of LAWCHA. "They have experienced unprecedented and disproportionate economic upheaval, yet they do not have the means to address their needs unless it's through organization," she added. Phillips hoped students learned from the labor activists, educators, and scholars who shared their personal experiences with the next generation of leaders. "Faced with obstacles to organizing that evoke earlier centuries, workers and their allies are creating innovative organizational forms and strategies in the U.S. and around the world," said Phillips. LAWCHA is an organization of scholars, teachers, students, educators, and activists whose purpose is to raise awareness of labor and working-class history through research, writing, and organizing.